The end of the year—and the most important time for fundraising—has arrived. Whether you’ve been strategizing for months or you’re scrambling to pull together an impromptu campaign, your goal is the same: Attract as many last-minute donors and donations as you can before the end of the year. To help nonprofits make the most of the holiday giving season, we brought together two seasoned development professionals for our webinar on easy ways to boost year-end fundraising. Our account managers, Rachel Muhlstein and Hailey Mitsui-Davis, have years of experience in nonprofit development. 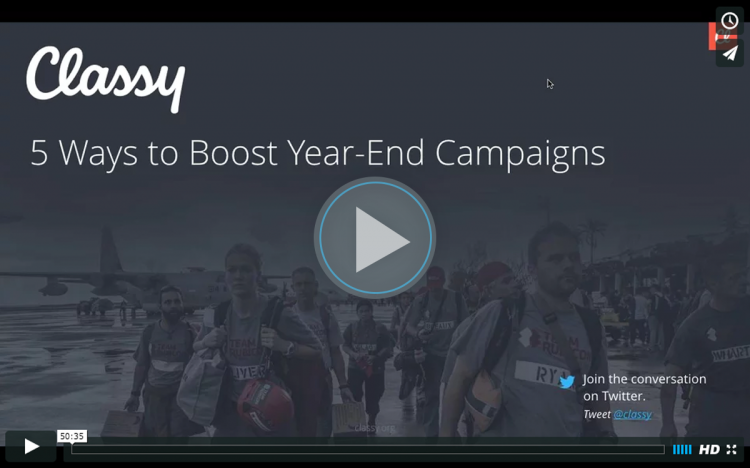 Use their five easy strategies to make this your best year-end campaign ever. ECards are a simple but powerful tool for the modern nonprofit. In just a few clicks, a supporter can donate to your organization in honor of a loved one and send them a customized eCard (online or through snail mail) to document it. This is an easy gift option that your supporters can give to their more charity-minded, less consumer-driven friends. You can create custom, branded eCards to offer supporters that feature your programs and impact. It can be as simple as adding your logo and a greeting to a great picture. Rachel mentioned that some nonprofits are even using GIFs to give their donors animated eCards. Whatever card you offer, it makes a holiday donation more tangible for both the giver and the honoree. “If you’ve only sent one email, I really would not expect much in return,” says Rachel. “We know that people need to be asked multiple times.” While it’s important to send out your campaign announcement and first appeal in early December, your mid-campaign email reminds people to get involved during those busy shopping weeks. Reworking your subject line and offering a new reason to give can keep your appeal fresh to readers. Late in the campaign, make sure you send an appeal letting supporters know that it’s not too late. The final three days of the year are some of the biggest for donations. Remember to keep your emails short and sweet. “I would rather receive three short emails from an organization than one long one,” says Hailey. You can always link out to a blog post for further information. Send donors straightforward messages to drive them toward making a gift. Once someone clicks on the “Donate” call to action, it should send them directly to your donation checkout page. During your year-end fundraising campaign, be generous with your favorites, retweets, and replies on social media. While you should appeal to your followers and update them on your campaign, don’t forget that interacting with supporters is just as important. “The littlest effort goes a huge way when it comes to this,” Hailey explains. Take a moment every day to go through and respond to comments and shares. This can help foster a sense of community and belonging that injects the holiday spirit into your campaign. To make promoting your year-end campaign as easy and attractive as possible, create some sharable images with impact pictures or fun facts. Even if a supporter doesn’t donate, they can share an inspiring image, like the one above, on Facebook and invite others to give. Just make sure to link to your campaign in the post or description. “People don’t give with their heads. They give with their hearts,” Rachel explains. A powerful story sticks with donors in a way that other content just can’t. It’s one thing to hear about a problem or program, it’s another entirely to meet the people affected by it. This is why individual stories should be built into your year-end campaign. 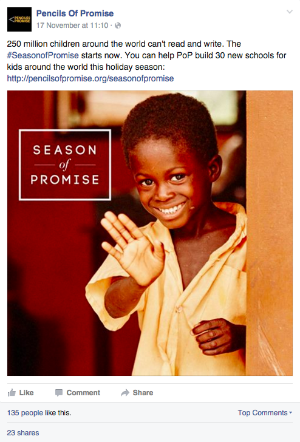 buildOn is promoting their year-end campaign by showing how their young volunteers give back to their community. They introduce one volunteer in an email and link to a more in-depth story on their blog. Images and experiences of volunteers are also a big part of their social media presence. Giving donors a specific person who will benefit from their gift makes it more personal. After all, half the fun of giving presents is watching the recipient open it. Show them who they’re giving to. December is the biggest month for charitable donations, which means it’s also a huge opportunity to acquire new donors and delight existing ones. How you follow up and thank supporters after your campaign will determine how many of those donors your organization will retain. Send every donor a meaningful thank you message (not just a donation receipt) and share the results of your campaign. You can even incorporate the individuals and stories from your appeals to show how donations like theirs help real people. For some extra peace of mind, you can prepare donor thank yous ahead of time. By preparing the design and copy of messages, you will only need to fill in your campaign results. Then when you schedule your emails you can “set it and forget it,” as Hailey says in the webinar. This means you can give supporters a great thank you without spending all of New Year’s Eve in the office. Apply one or more of these strategies to engage, convert, and retain donors during the most important fundraising season of the year. To get all the tips and tricks from our fundraising experts, check out the recorded webinar.